York Minster and Durham Cathderal are historically and architecturally two of the most important cathedrals in Europe. They were the only cathedrals in the North East and Yorkshire regions until Ripon's Minster and Newcastle's church of St Nicholas became cathedrals in 1836 and 1 882. York cathedral, although known as a minster, is officially the Cathedral and Metropolitical Church of St Peter in York . 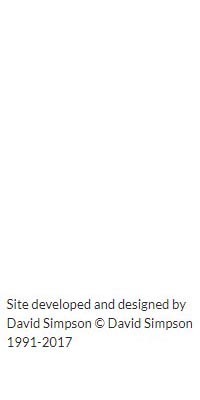 By definition a cathedral is the site of a bishop's throne (a cathedra) but the word 'cathedral' did not come into use until after the Norman conquest. In Anglo-Saxon times and beyond important churches were known as minsters, but not all were bishops' seats. York Minster's history began in 627AD when King Edwin of Northumbria was baptised in a simple wooden church at York within the site of the old Roman fort. The church was approved by the Pope and its dedication to St Peter reflected its links with Rome. T he wooden church was rebuilt in stone and completed by King Oswald but the bishop's seat was transferred for a time to Lindisfarne. The minster was rebuilt again in 664AD and again after a fire in 741AD. It was eventually destroyed during the Norman sieg e of the city in 1069. The predecessors of the bishops of Durham were the bishops of Lindisfarne who transferred their diocese to Chester-le-Street in 883AD. A Saxon minster was built and a succession of nine bishops reigned there until moving to Durham in 995AD. A wooden mins ter was built at Durham in 995AD and rebuilt in stone in 999AD. It stood for 94 years until 1093 when it was replaced by the Norman cathedral. York Minster is built in the Gothic style of architecture but what is not widely known is that York was once, like Durham, a Norman cathedral. The Norman cathedral at York was started before Durham in 1070 by the Archbishop of York Thomas of Bayeux and a Norman choir was added towards the end of the following century (after Durham) by Archbishop Roger of Pont L'Eveque. Roger's work seems to have been influenced by Durham Cathedral, but the only remains of the Norman Cathedral at York are below ground le vel in the minster crypt. 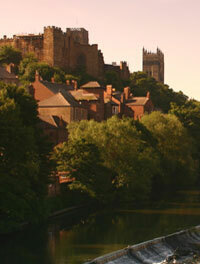 Durham Cathedral is widely regarded as Europe's finest Norman (or Romanesque) cathedral. It is almost entirely Norman in style and the work of Bishop William of St Carileph. It was completed in 39 years from 1093-1132 but some of the old priory buildings around the cloisters are earlier. One notable feature of the cathedral is the rounded pillars (or piers) with their zig-zags, spirals and other patterned decorations. The innovative ribbed vaulting at Durham was the first of its type in the world and enabled much higher vaulting through the use of pointed, ribbed arches. The pointed arches in the Norman nave at Durham were the embryonic stages of the style of architec ture which would come to be known as Gothic. Another architectural feature developed at Durham was Flying Buttresses which gave extra support to the vaulting. They are high in the roof of the Triforium and not on view to the public. York Minster represents almost every stage of the Gothic style of architecture from 1230 to 1475. The Gothic style is most notable for its distinctive pointed arches and its rich decoration. The present York Minster was built from 1220 and the old Norman cathedral was dismantled in stages as Gothic additions were made. The Gothic style was adopted at York to keep up with the new fashion and to allow considerable enlargement to the cathedral in keeping with its status as the centre of an Archbishopric. Minster was started around 1220 by Archbishop Walter de Grey (1216-1255). He replaced the Norman transepts with Early English Gothic transepts in the period 1227 to 1260. The new transepts dwarfed the Norman nave so one of Grey's successors, Archbi shop John Romanus, replaced the nave with a new Gothic structure from 1291. The Norman choir was replaced by Archbishop Thoresby from 1361 and by 1400 the minster was entirely Gothic. The central tower was added in 1405-1415, using money donated by Walte r Skirlaw, the Bishop of Durham, and the western towers added from 1433 to 1475. The minster was finally completed and consecrated on July 3, 1472. Although most of Durham cathedral was built in the period 1093-1132, there were three major additions: the Galilee Chapel, the Chapel of the Nine Altars and the great central tower. The Galilee chapel (or Lady Chapel) is situated at the west end of the c athedral beneath the twin towers and is most famous as the site of Bede's tomb. It was built by Bishop Hugh Pudsey in 1174 and is late Norman in style. The building has the appearance of a Moorish palace. Chapel of the Nine Altars (a transept) lies at the east end of Durham cathedral and is Early English Gothic in style dating from the time of Bishop Richard Poore (1228-1237). Poore later became Bishop of Salibsury and built the cathedral there. The Nine Altars was built to accommodate vast numbers of pilgrims visiting St Cuthbert's shrine. Its measurements and structure were based on a transept at Fountains Abbey, but the mason miscalculated the dimensions. Examination of the chapel roof reveal s the mistake. The main feature of the chapel is the great Rose Window. Pilgrims were a rich source of revenue for Medieval cathedrals and before the murder of Thomas Beckett at Canterbury Cathedral in 1170, St Cuthbert's shrine at Durham was the most visited. It was one of the most richly decorated monuments in England. 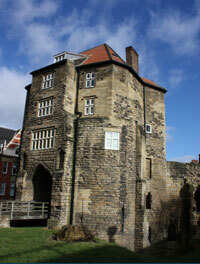 The remains of Bede were an added attraction at Durham but York lacked a saint's shrine. In the 13th Century William Fitzherbert, Archbishop of York, was posthumously canonized and became St William of York. This encouraged pilgrims to visit York and helped the minster compete with other shrines such as St John Lee's at Beverley Minster. Cathedral is built of sandstone mined from quarries at Kepier, a mile along the Wear east of Durham. Black Frosterley marble from Weardale is extensively used for decoration in the cathedral. It is embedded with fossilized sea shells. York Minster is built of Oolitic limestone from the Tadcaster area and gives the minster its white appearance. Fine examples of stained glass can be found in Durham and York, but York has the highest proportion of Medieval stained glass of any European cathedral. Both cathedrals have magnificent Rose Windows, York's is known as the Heart of Yorkshire. One of the more unusual windows at Durham is the Last Supper, a 20th Century window installed in 1984. In terms of the church, the archbishops of York were always of senior rank to the bishops of Durham. In Medieval times the bishops of Durham held political powers (as Prince Bishops) which gave them additional status. Their throne at Durham is the highes t in Christendom and higher than that of the Archbishop of York. One of the key differences between Durham Cathedral and York Minster is that Durham had a monastery attached to it and York did not. The buildings of Durham monastery (dissolved in 1540) were clustered around the cloister on the south of the cathedral an d were administered by a Prior.